I need help with my settings in nvcp or do i need to install pixel patcher? Currently i can do 4k uhd (3840x2160) @ 60hz using nvcp i want to create another custom resolution for my fps games which is 2560x1440 with higher refresh max possible (144hz?) for this setup. thank you guys. Edit: seems i can reach 144hz in 4k but not in 2k. Are there any cons for using 4k resolution @ 144hz using nvidia control panel? Will my monitor or gpu get rekt faster? 2nd edit: 144hz @ 4k doesnt save but testing succeeds on nvcp. That monitor only supports 60 Hz. It skips frames at higher refresh rates. There's no way you're getting 3840x2160 @ 144 Hz. That's simply not possible with DisplayPort 1.2. 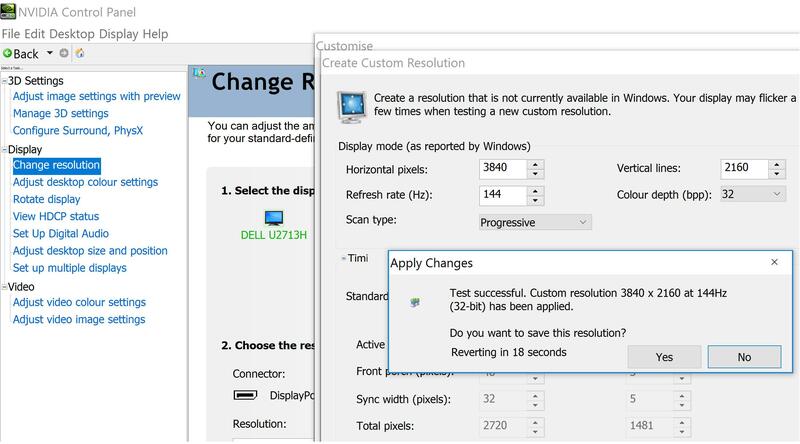 Yes apparently nvcp succeeds in testing mode but doesn't save it as selectable resolutions afterward. When i click yes it doesn't list it. Does resolution help improve or increase refresh rate? My max for now is 70hz @ 4k in nvcp. If i do 2k resolution will it improve? Thank you for your very fast response really appreciate it. Edit: After trying 1hz at a time i am capped @ 73hz any resolution 2k or 4k. My settings below is automatic. Does manual settings help to increase it? I cant post more than 500kb attachment so here is a link for the nvcp test 4k @ 144hz. it says succesful but doesn't list at the menu afterwards. There's no point in using higher refresh rates with that monitor because as I said, it skips frames at refresh rates higher than 60 Hz. This should be obvious just by moving the mouse cursor. I have another question if i may ask. What is the difference between a native or true 4k resolution vs a screen overclocked to use 4k resolution? Because there is this monitor, a 1080p monitor with 144hz in a review that the poster said can be overclocked to 2k resolution @ 144hz and to 4k @ 60hz. If the difference is very drastic I'll just save for a true 4k monitor. LCD monitors can't be "overclocked" to a higher resolution. Higher resolutions are scaled down, so you don't get the same clarity. Your screenshot shows you created a GPU-scaled resolution, so the monitor is not even doing that. Thank you very much for the answer i guess i am saving til christmas then.